Hi! It's Wednesday. Time to blog again according to my internal blog clock. 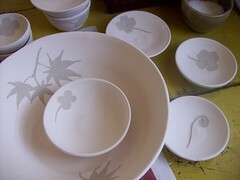 This is what I did yesterday- the detail glazing for the last kiln-load of pottery I fired. This morning I waxed the details and the bottoms of these pieces. This afternoon and tomorrow I will wax the bottoms of the load. On Friday, my friend and self-designated "glaze slave" Diane (a member of the "Memphis Knit Mafia" -you can find us on Ravelry) is coming to help me dip-glaze all of the pieces. And probably do some mixing, too, because I doubt I'll get all of the mixing and screening finished before her arrival. This is the first time I've had a glazing helper- and I'm excited, because glazing is my least favorite part of pottery and if I have help, maybe, just maybe, it won't take the entire day. I hope your Wednesday is sunny and balmy and beautiful- it is absolutely gorgeous here. Little boy and I are going to have some after-school playground time today!